Earlier this year, my best friend and I spent the week exploring the Whitsundays and beautiful Airlie Beach. Besides the exhausting humidity and the usual North Queensland summer rain, our trip was spectacular and we had an amazing time! The last time I visited Airlie Beach I was about 12 so it was fun exploring it by ourselves. We decided whilst on our trip that we wanted to go and do a snorkeling day trip . After some research we stumbled across a company by the name of Ocean Rafting. This company had excellent reviews all across the internet so we knew this would be the one for us! Heading out in Ocean Rafting’s inflatable boat. Ocean Rafting offers an exciting side to a regular snorkelling and island tour, with semi-rigid inflatable vessels which can travel up to speeds of 65km/h! They offer two kinds of tours, which offer either more snorkelling time in the beautiful coral reefs or more time on the stunning white sanded beaches – depending which suits you best. 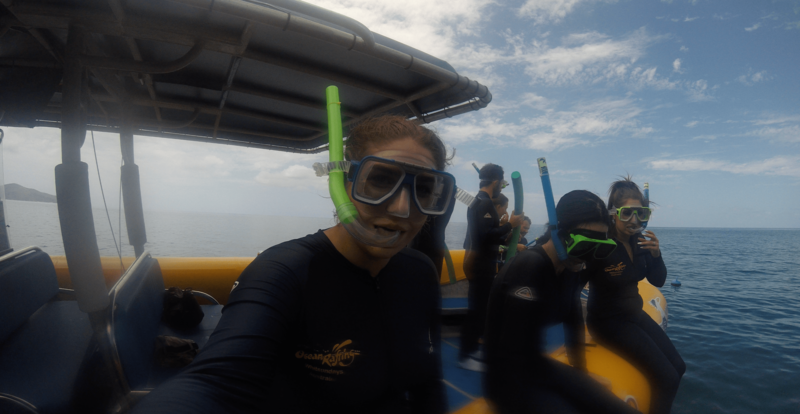 We decided to go for the Northern Exposure tour which gave us almost 2 hours of snorkelling time. All set to start snorkeling. Our day was excellent from the very beginning, with a shuttle bus which picked us up right on our doorstep and dropped us at Abell Point Marina where the tour begins. Check in was a breeze and the staff were incredibly friendly. We jumped on our boat Jammin’ with our skipper, Tim, and our eco-host, Crystal and set off! 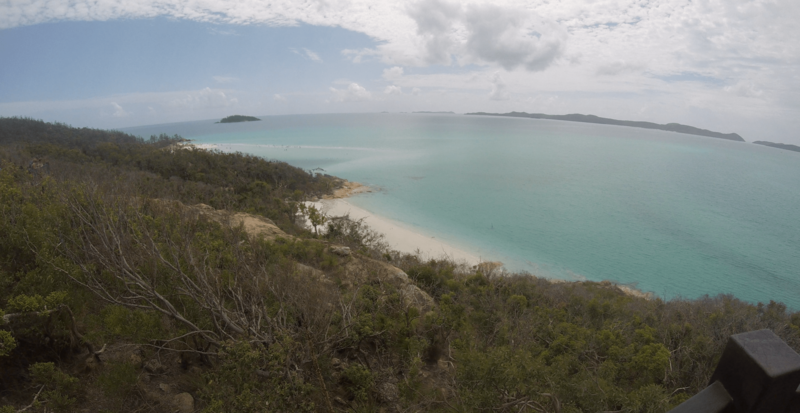 Once out of the marina, our first destination was Hill Inlet on the north end of Whitehaven Beach. Crystal walked with the group up to the top of the Island to the lookout point and the view was absolutely incredible! As far as the eye could see there was crystal clear blue water, white sand and islands. The view from Hill Inlet Lookout was absolutely spectacular. We swam at Whitehaven for over an hour and enjoyed a delicious buffet lunch of salads, cold meats and mussels! They also have soft drinks, beers and ciders which can be purchased on board during the day. Enjoying our delicious buffet lunch. Our next stop was a snorkelling location around half an hour from Whitehaven. We swam with hundreds of fish and even had a few Giant Trevally’s and Hump Headed Maori Wrasses visit us. It was so surreal swimming with our beautiful marine life! It was amazing to see this huge fish up close. We then headed to our next snorkelling spot which was a coral reef. There was still quite a lot of damage from Cyclone Debbie, but the reef was still beautiful and thriving. We went on the hunt for turtles but unfortunately none paid us a visit. The fish were so colourful. 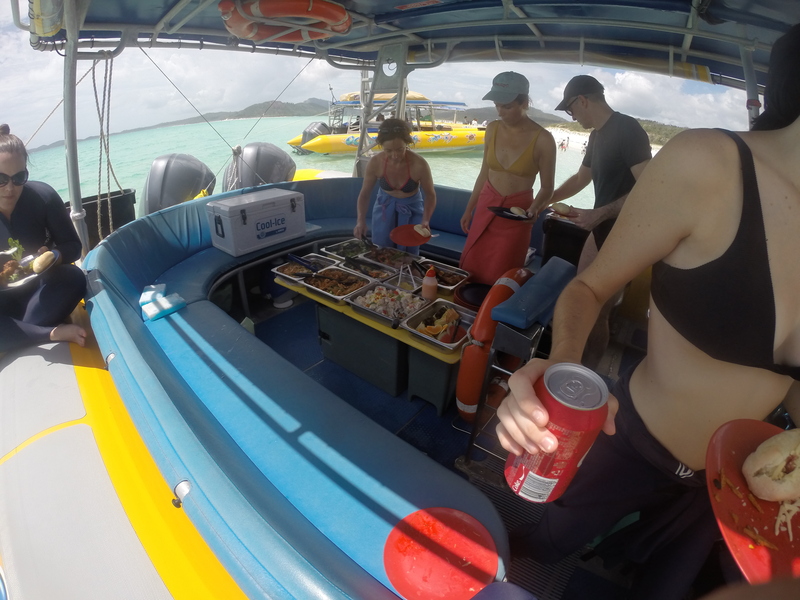 We then headed back to the marina after an amazing day of snorkelling and exploring the islands of the Whitsundays. Tim and Crystal were absolutely fantastic, and so knowledgeable and passionate about their jobs and everything to do with the amazing place they call home. The Northern Exposure tour will set you back $155.00 and the buffet lunch $15.00. But I think you will find that it is worth every single cent! We took away some amazing memories and hope that more people will be able to take part in an experience like this to get a better appreciation of our amazing oceans! In Mr and Mrs Oz’ famous words – Safe Travels!! Going to the beach is so much fun, you just don’t get to swim but interact with the nature..